The first half of Population Wars reads like a piece-meal, out-of-order autobiography, with Graffin narrating several fairly ordinary moments of his extraordinary life. There’s a catch. He’s narrating as a biologist with a keen eye for the ubiquitous biological struggles that lie just beneath the surface of our seemingly ordered lives. Whether we realize it or not, our perfectly manicured lawns are the result of a constant and bloody three-way battle between invasive species, native species, and us. Our water wells unwittingly tap a primeval population of extremophiles, confused and desperate as they rush through copper pipes, burping their flammable breath. Our immune system walks a delicate and diligent balance between murdering suspicious invaders while fostering the “native” population of beneficial microbes in our gut, on our skin, and in our various respiratory nooks and crannies. All around us, populations are pitted against each other, eking out an existence with limited resources. That populations fight for survival is not exactly a new concept, but Graffin is here to remind us of what we too often forget: the wars can never be won. The best-case scenario is a draw. Sure, small battles can be won, giving a temporary victory of one population over another. Most people will defeat the flu when they get it; Graffin was able to finally clear his pipes of at least the most problematic species of anaerobic bacteria; and many lawns in LA are visibly free of any signs of weeds. But those victories are fleeting. You’ll get sick again next year. The weeds will come back. As Graffin puts it, “Perhaps the real ‘hell’ of war is that you can never really win one.” The most successful species are those that have adapted their way out of the head-to-head battles and into a peaceful coexistence with their competitors. This is sometimes called “resource partitioning” by evolutionary biologists, but it can take many other forms of compromise as well. 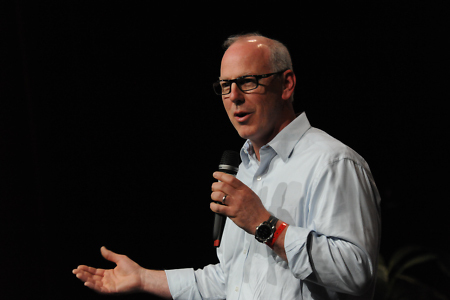 Mixed in with Graffin’s tales from his suburban Wisconsin upbringing, his formative years in LA, and his rural plot of land in upstate in New York, are life lessons that he learned while hitting it big with his punk band Bad Religion in the 1980s and their many annual tours throughout Europe and North America. One gets the distinct impression that Graffin would be a blast to travel with, be it hikes in the mountains or drudges through European tourist traps, because Graffin, like most scientists, cannot help but point out the science around him. Most people simply see a cut that needs a band-aid, but Graffin sees white blood cells using tricks they learned from ancient amoebas to fight off invading bacteria. There is an urgent reason that Graffin has chosen to dazzle us with these tales of biodiversity and “life finding a way.” Humans are a species, like all others, in a struggle for survival. However, since the dawn of civilization, we have been drifting ever further from our place within the delicate balance of the population wars. Nature provides an intuitive wisdom, hard-earned over a billion years of struggle and catastrophe, that compromise and coexistence are the only way to adapt. We are risking it all when we turn our backs on that wisdom. He begins his look at the population wars within Homo sapiens with the painful history of the European settlement of North America, focusing on his home turf, upstate New York. We know the winners and losers in that struggle, but both sides showed short-sightedness in their failure to understand the other. The Native Americans, however paradoxically, were on the losing end because of their noble vision of themselves as a population in harmony with nature. The Europeans, on the other hand, viewed nature as something to be subdued, Natives included. Of course, Europeans were hardly alone in this pattern. What Graffin fails to mention is that the ancestors of Native Americans dramatically transformed the landscape of the continent when they first arrived, hunting many species, including all of the megafauna, to extinction. While this pales in comparison to the current onslaught being wrought by our “progressive” and “developed” economy, the tendency to exploit biotic resources in reckless and self-defeating ways is depressingly universal. It seems likely that the wisdom shown in the harmonious and sustainable lifestyles of many of the First Nations was hard earned. His criticism begins with Malthus and Darwin but extends well into our aggressively capitalist age. Graffin paints Richard Dawkins and other neo-Darwinians as obsessively preoccupied with competition. Where they see victorious or vanquished warriors, he sees compromises, assimilation, and even cooperation. He draws inspiration as much from the likes of Lynn Margulis as the alfalfa fields on his property. As he develops this view, we get a concise history of the progression of Darwinism from the Victorian era until today. Throughout this history, in his view, many biologists have missed the forest for the trees. The final chapter of the book is a coda introducing a theme that he only obliquely builds toward in the book: free will. How much do our conscious intentions really have to do with how and why we act? Are we really in control of our lives and our fate? On the one hand, Graffin makes a strong argument that we aren’t, providing condensed versions of the prickly neuroscience-based arguments made by Sam Harris, Paul and Patricia Churchland, and many others. On the other hand, his book is nothing if not a call to action, begging us to change how we view the world and how we live in it. That is not necessarily a contradiction, but it can feel like one if not carefully thread. The absence of free will does not presuppose fatalism and Graffin clearly hopes that his book will be a stimulus, an input in our decision making process, that nudges us toward making more thoughtful choices in how we treat one another and the way we interact with our environment. I hope that, too. The new book “Population Wars: “ by Greg Graffin is a witty and light look at our modern world and the biological processes that underpin it. It reads more like a conversation with a geeky friend than a biology text or a self-righteous treatise, but make no mistake: it is both. The naïve and the expert alike will learn things when they read this book, making it an excellent pick for biology students. In addition, we would do well as a species to heed the lessons we can learn from bacteria, amoebae, and white-tailed deer. Graffin teaches those lessons well while entertaining his audience. This is a fun book to read.